What started as a mint jelly turned into a thai glaze. Hehe it’s crazy how stuff like that happens sometimes. We picked up mint at the market, while we were there the basil called to us, then we found some tasty hot peppers, then lemongrass…well something had to be done! Done it was. I made jars of this stuff to have on hand as a glaze for all sorts of meats or to add to a stirfry as a dressing. Makes a nice subtle marinade too! 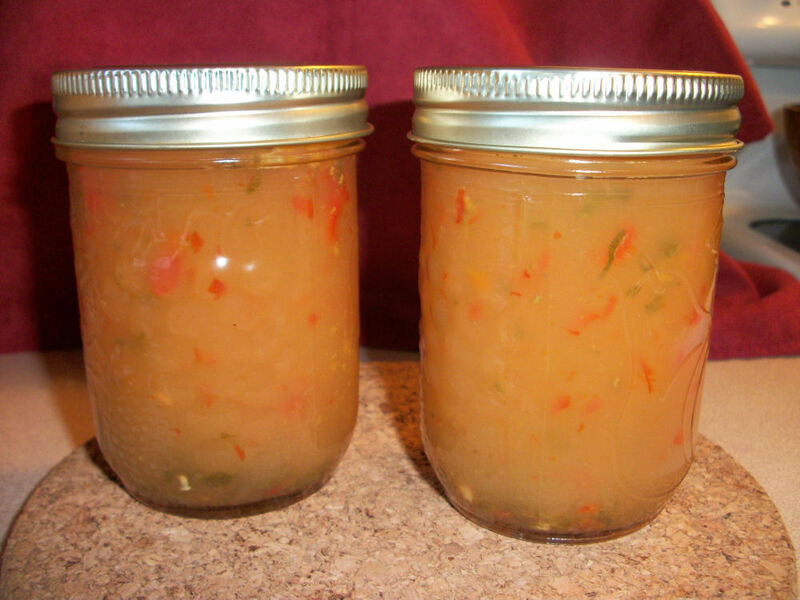 It was definitely a fun experiment in canning. Combine the 1 cup of mint, 3/4 cup of basil, lemongrass and water in a saucepan. Bring to a boil. Remove from heat and cover. Allow to steep 30 minutes. Strain and press all liquid out of the leaves. Combine all the liquids, splenda, and pepper in the saucepan. Boil 2 minutes stirring constantly. Remove from the heat and stir in the gelatin sheet. Add remaining herbs. Makes enough to fill 3 250ml mason jars. Each jar contains 64.4 calories, .1 grams of fat, and .8 grams of fibre. Yeah…each jar. That is the kind of glaze you can go nuts with. Want to see our first invention using it? Tasty! We used the glaze as a marinade with a couple of chicken breasts. Did up two portions of rice noodles according to the package. 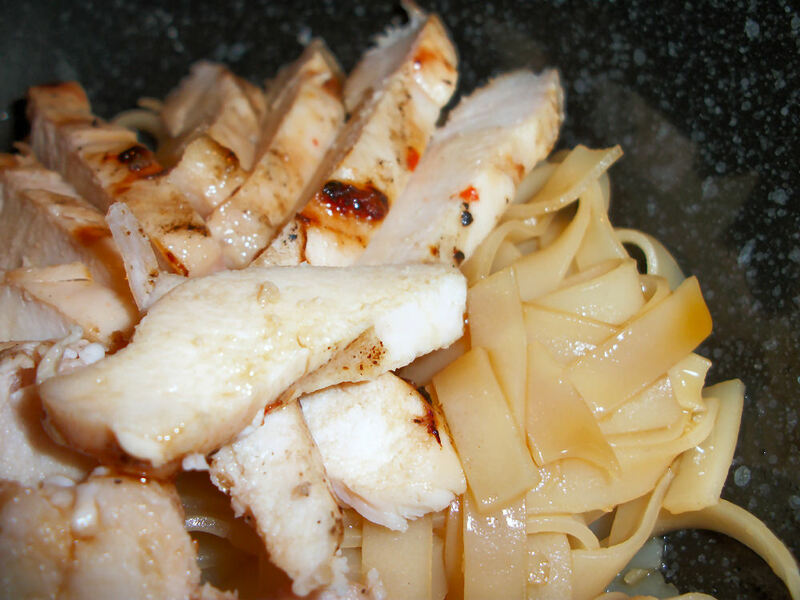 Added a tbl of soy sauce and honey to the noodles, tossed, and topped with the grilled chicken all nicely sliced up. Goodtimes. Can’t wait to try this with pork sometime. The glaze is a really bright and lemony type of thing. Not as spicy as I had hoped but my husband thinks a couple of coats during grilling will yield more spice. This entry was posted in Ingredient and tagged Basil, mint, sauce. Bookmark the permalink.